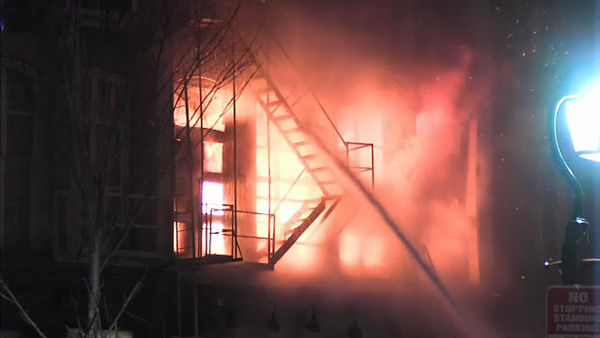 PHILADELPHIA (WPVI) -- City officials are allowing some residents back into their homes while others can only enter to retrieve items after a 4-alarm fire in Old City earlier this week. Residents of homes that remain too unsafe to live in have been allowed to re-enter briefly to retrieve medications, documents, and other necessities. These properties include 241-43 Chestnut Street, 45 S. 3rd Street, 41-43 S 3rd Street, and 24 S. Bank Street. In all cases, officials say residents should contact property managers to make arrangements for re-occupancy or retrieval of belongings. Watch video from Chopper 6 over the aftermath of a major fire in Old City Philadelphia on February 19, 2018. The fire broke out at 239 Chestnut Street shortly after 3 a.m. Sunday. 4-alarm fire breaks out in Old City. Bob Brooks reports during Action News at Noon on February 18, 2018. Arriving firefighters found heavy smoke showing from a building with a store on the first floor and apartments on the above levels. According to the commissioner, despite the fire alarm sounding, a number of people did not evacuate from their building. "We had to go back into the buildings and tell people 'this is serious.' Despite the smoke, despite the fire alarm sounding, it's a serious thing, you never know what you're building is connected to, so we literally had people who were connected to the building that was on fire who had not evacuated," Commissioner Adam Thiel said. Fire commissioner gives update on 4-alarm fire. Bob Brooks reports during Action News Mornings on February 18, 2018. A second alarm was sounded around 4:20 a.m. The fire reached three alarms around 5:11 a.m., quickly followed by a fourth alarm. The fire was brought under control shortly before 7:30 a.m.
Officials have determined that 24 S. Bank Street is physically connected to 237 Chestnut Street, one of the locations of the fire and of reoccurring hotspots. They say the building contains 60 residential units that cannot be reoccupied until fire alarm and other fire protection systems are repaired and a firewall is built between 24 S. Bank and 237 Chestnut. To alleviate pressure on 239 Chestnut Street, where the fire originated, L&I removed the building's multi-story fire escape on Tuesday. L&I officials say they are determining how best to stabilize neighboring buildings so that 239 Chestnut can be taken down safely and without causing further damage to these buildings. The Philadelphia Fire Department will maintain an engine at the location to continue to combat hotspots. S 3rd St between Elbow Lane and Walnut Street. The investigation of the Fire Marshal's Office and the federal Bureau of Alcohol, Tobacco, Firearms and Explosives (ATF) into the cause of the fire is ongoing.